December is here and its time for my final 2017 quarterly dividend update. Cannot believe 2017 is almost over. My portfolio is composed of vanguard ETFs which pay dividends on a quarterly basis. For third quarter in a row, my dividends hit the three figure mark. I have mentioned that I wanted to sustain this trend and it seems like I have successfully sustained it for three quarters. My estimated dividend for 2018 Q1 is already above the three figure mark. In my 2017Q3 update I mentioned a new goal of 200$ in dividend in a single quarter. Mission accomplished. 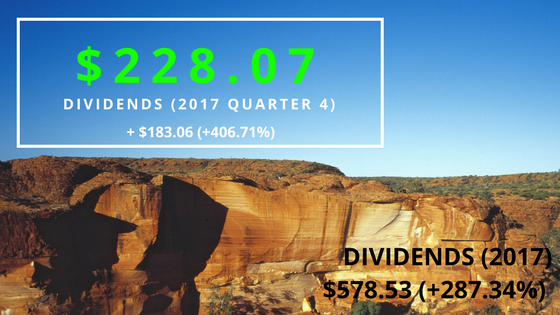 I received $228.07 in dividends, with a 406.71% increase in my dividends as compared to 2016Q4. 2016Q4 was my first quarter of sustained investing. I call this as organic increase in dividends. Massive disappointment in this front. Whereas 2017Q3 had some massive organic increases, 2017Q4 was all down. The only exception being my Ex-US ETF. My Ex-US ETF had a 38.56% increase in dividends. The worst was from my S&P 500 ETF with a drop of -8.64%. Fortunately given my asset allocation and healthy increase in Ex-US dividends I was still able to get a 9.15% overall organic increase in dividends. S&P 500 ETF (VOO) is about 38.43% of my portfolio and continues to be the major component of my portfolio (down from the highs of 50%). Ex-US stocks account for 31.45% of my portfolio. The rest is made up of dividend achievers, value and high yield stocks. My expense ratio is 0.102%. I have been rapidly growing my value stocks position. The idea is to increase exposure to financial stocks, with the increasing interest rates I believe the financial sector will do well. It also helps to diversify my portfolio as I am heavily into technology sector (Thanks to VOO). @dividendgeek - a 400% increase, awesome. Can't complain about that.